Is it me or is this year just flying by? Well, ladies and gents, summer is fast approaching and we are 1/4+ way of the year already. I don't know about you guys, but I certainly have started to go to the gym more often now - I mean who doesn't want that beach body ready for summer? 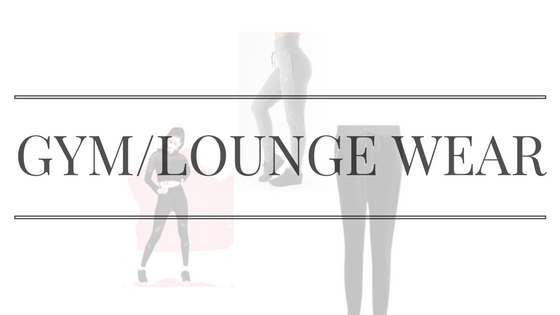 As the title of this post suggests, this wishlist will be featuring the latest trends in gym wear and lounge wear. I have recently been looking at a few items of gym and lounge clothing which I would love to have this season in my wardrobe. Firstly, to begin with, I love to lounge about. I love a pair of comfortable joggers/tracksuit bottoms which I can wear out to the gym, at home or even to dress up! I do love my joggers to be fitted, comfortable and have that figure hugging look. Manière De Voir is a UK-based fashion brand who feature the latest designs and trends. This pair of velour tracksuit looks comfortable and luxurious due to the satin detailing. It definitely reminds me of Juicy Couture and you guys know how much I love my designer items! It is also of slim fit, with silver zip detailing around the ankle. This adds an extra dimension and gives this pair of tracksuit that extra edge over others. Right now it is on sale for £16.99 from £32.99. Bargain right?! Considering it looks far more expensive and is definitely a pair I would dress up to wear during an evening. This is available to purchase in XS, S, M, and L. I can see myself wearing this with a pair of silver strappy heels and a black vest top. There is also a matching velour hoodie available on the website which I would happily pair this with for day to day wear. Another pair of joggers which I have been lusting over is this one from Gymshark. 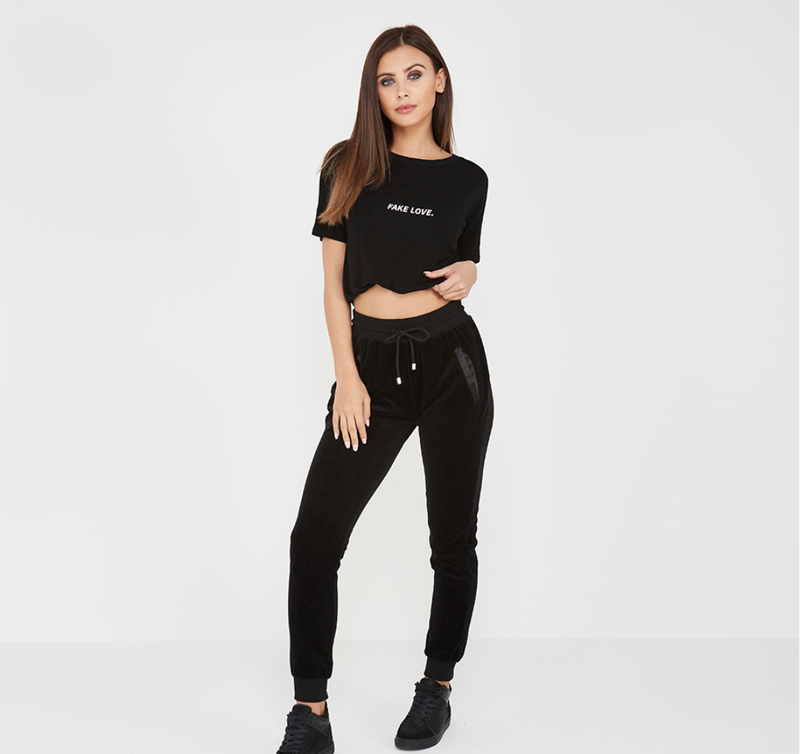 These joggers are high waisted and I love the dark charcoal grey version. One advantage of high wasted joggers is that it keeps 'love handles' in and gives you that illusion of a bigger booty! Gymshark specialise in gym wear and lounge wear and I have previously purchased their 'fit leggings' which I love due to them being squat proof! These joggers retail for £36.00, so it might be worth looking round for discount codes. When I am in the gym, I want to look good and it is important to have a good pair of leggings which allow your legs to breathe. This pair of leggings feature the mesh design, therefore allowing air to go in. This will prevent your legs from getting sticky from the sweat. You know what I mean, that feeling of stickiness? Well yeah, you do not want that! This mesh style design is latest in the gym wear, and I have seem plenty of girls looking glamours at the gym with similar style leggings! This mesh hoodie is perfect for this spring/summer season. Can you guys tell my love for 'mesh' by the way? I can see myself wearing this with a nice bralet underneath as a casual outfit as well as with a gym bra to the gym of course. I hate showing my arms at the gym or anywhere, that is one of my insecurities and therefore you will see me 99% of the time with long sleeves. I love the fact that this is see through and thin as it will allow air to go into my body, keeping me cool and at the same time covering my arms! Winner, winner! This hoodie retails for £22.99. Right guys, that is it for my gym/loungewear wishlist. I hope I have inspired you guys with a few latest trends and designs which are available in the fashion industry at this moment. Don't forget to let me know what is your favourite item and what is on your wish-list! I really like the mesh top and the velour tracksuit. I totally understand what you mean by juicy couture! Personally I think gymshark is overly expensive for the quality.